The Hindu wedding is one that varies depending on region and personal preferences. There is no one standard for a Hindu marriage ceremony (vivaah sanskar), but a few traditions that are widely practiced. A Hindu wedding focuses not just on the bride, but of the joining together of two families. The wedding is comprised of many rituals which can last several days. These customs begin with the meeting of the families together for dancing, food and drinks. What can be considered the most important tradition is the taking of the seven steps (saptapadi). The bride and groom take seven steps, each step which includes a vow or promise to each other before fire. In India, this is the tradition that is considered the binding element of a marriage and no ceremony is considered official until this is completed. Hindu ceremonies are very colorful. Unlike a traditional American wedding, a Hindu bride will never wear white for this symbolizes widowhood in Indian culture. The bridal dress will be a sari adorned with appropriate ornamentation. Her hair will be covered with a veil as a marker of respect for the deities. Haldi is the practice of staining oneself with turmeric, which dates back to the earliest Vedic texts. 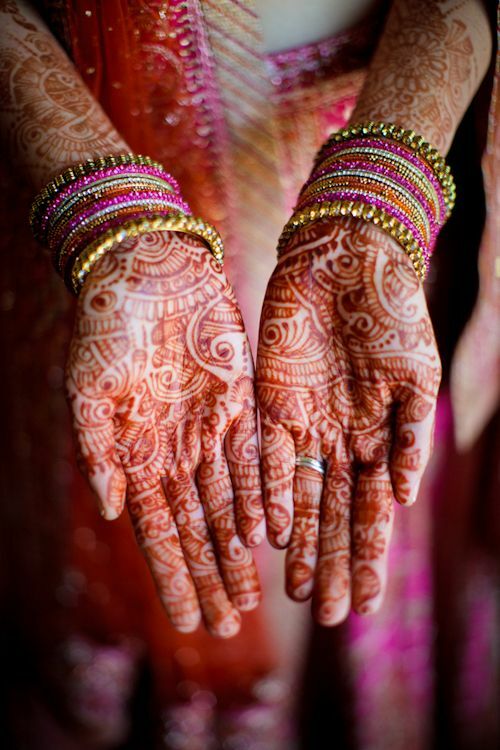 In a Hindu wedding, this is typically applied to the palms and feet in traditional designs representing the sun and the idea of awakening inner light. Hindu weddings are very colorful and beautiful ceremonies rich with culture and tradition. Contact Rock N Events to learn more!